Sofia Samatar’s debut, A Stranger in Olondria (2013), was a strange, remarkable, hard-to-pin-down novel. Though firmly rooted in the tropes of the epic fantasy genre—it took place on the fringes of a civil war rocking a fantasy-world empire, and its central story involved a haunting, and a hero thrust unwillingly into the role of prophet and mystic—what it did with these elements was decidedly antithetical to the genre’s conventions. Stranger read more like a travelogue than an adventure story, and the aspects of its story that we might consider fantastic struck its protagonist as thoroughly, boringly mundane, even as he marveled at such hallmarks of modernity as bookstores and poetry readings. Now comes The Winged Histories, which Samatar describes as a companion volume to Stranger, and which takes what we might describe as a more conventional (to use the word very, very loosely) approach towards the epic fantasy genre. Where A Stranger in Olondria observed the civil war that nearly tears apart the Olondrian empire from the point of view of an uncomprehending (and, for the most part, uninterested) foreigner, The Winged Histories gives us the perspectives of four women intimately connected with the war’s buildup, progress, and aftermath. It is the sort of book that opens with a map and a family tree. Some of its plot points—an ascetic, moralistic religious cult that sweeps through the empire’s ruling class, finally amassing enough power to condemn and overpower even the monarch; an embattled prince fleeing to safety on the back of a winged mythical creature; the reemergence of a dimly remembered monster out of history that makes the story’s political disputes seem insignificant—feel as if they might have been taken from recent seasons of Game of Thrones. It is, in fact, a little surprising that Histories follows Stranger instead of coming before it—one might have expected the first novel to act as a pendant to the main action of the story described in the second. At the same time, it isn’t surprising at all. On her blog, Samatar describes The Winged Histories, and the entire Olondria project, as one in which "I try to say everything about my love-hate relationship with 'epic' or 'high' or 'heroic' fantasy." Within the novel itself, this is clear almost from the first page. 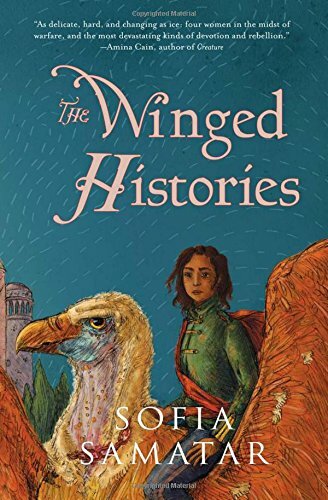 As much as it is a work of genre fiction, The Winged Histories is also a narrative of how that work came to be written—three of the four heroines are writing their story down as we read it, and all of them are concerned with how their role in the story will be viewed, and how their choice to embody a particular character type has determined the course of their lives. Finally, each of the narratives in The Winged Histories is a critique of its own genre and its tropes, and of the way that fiction, language, tradition, and narrative expectations can trap people—women, perhaps, most especially—in a story not of their own making. Samatar’s use of language, which as readers familiar with her work will have come to expect is nothing short of stunning, plays an important role in making this point. Though The Winged Histories is, technically, more plot-driven than A Stranger in Olondria, and more full of event, the narrative repeatedly refuses the allure of a straightforward progression of plot. Paragraphs sweep effortlessly from past to present to future. Sentences run on in asides that suddenly pause the action to muse about the genesis of a dessert, or a recollection of the narrator’s long-dead relative. It’s a style that seems designed to stress to the reader that what’s important about this story isn’t what’s happening but how the characters feel about what’s happening. At the same time, Histories is never tedious or hard-going. It’s never unclear where we are in the story or what’s happening in the wider world around the characters. But while the Olondrian civil war is always interesting, Samatar makes it clear, through her characters and her use of language, that it also isn’t important (when the eventual winner of the war turns out to be a minor character who has barely been seen on the page before this point, it’s hard not to conclude that this is the best thing for everyone). What is important are the windows that Histories’s heroines give us not just on their nation’s history, but on the narratives that inspire it, and them. In order, the four heroines of The Winged Histories are: Tavis, a captain in the Olondrian military, and a veteran of a long, costly, pointless war on the empire’s northern border. The daughter of the ruling house of Kestenya, one of the nations that make up Olondria, Tavis dreams of independence for her people, despite or perhaps even because of the fact that she is essentially their oppressor, part of an aristocracy brought in to control and suppress the unruly local tribes. She joins her cousin, the crown prince Dasya, who leverages the unrest over the war, and Kestenyi nationalist feeling, to foment a rebellion. Second is Tialon, who appeared briefly in A Stranger in Olondria. She is the daughter of the high priest of the Stone, a religious cult that reveres writing, and particularly a mysterious artifact covered in etched writings from many different time periods and in many different languages, which has become dominant among Olondria’s ruling class, suppressing the more popular, mystical cult of the goddess Avalei. When Dasya’s rebellion overturns her father’s tyrannical power over the royal court, Tialon is left in limbo, waiting to be either executed or liberated. Third is Seren, a member of one of the nomadic, illiterate tribes in the Kestenyi desert. She is Tavis’s lover, and a singer of epic ballads, who is both deeply distrustful of the literate Olondrian culture, and curious about its ability to expand her art so that it speaks of something beyond war and death. Finally, Siski, Tavis’s sister, is a social butterfly and bright young thing whose betrothal to Dasya was mysteriously broken off in their teens. In the aftermath of his rebellion’s failure, she nurses him and reveals to us what happened to drive them apart, and her into a life of heedless, heartless pleasure. Each of these women is defined by narrative, but perhaps none more than Tavis, whose story feels, of the four, the most defined by its literary antecedents. Tavis models her life on The Swordmaiden's Codex, by Ferelanyi of Bream, a woman warrior who wrote a detailed, common-sense guide for the women who would try to follow her, warning them that the life they’ve chosen is neither easy nor romantic. The chapters of Tavis's narrative are introduced with passages from Ferelanyi's book (as Tavis, in a metafictional trick typical of this novel, promises to do—"I think I could tear one leaf from Ferelanyi's book and place it at the head of each chapter of my life"), but these seem as much a response to popular, real-world criticisms of the warrior-woman trope—such as a passage that seems designed to counter the frequent, whiny complaint that of course women can’t go into battle because what about their periods. There is also the small matter of the swordmaiden's monthly blood. It is advisable to stanch the flow with rags, and to wash these rags in privacy, if at all possible, as one's companions may find the subject cause for jest. It is also acceptable to follow the example of Maris, who slew two men in duels prompted by such insults, or of the False Countess, who used to discuss her flow openly in her camp, as she and her men together discoursed on the issue of their bowels. But for all the coarse matter-of-factness of Ferelanyi's observations, it’s clear that Tavis herself has not learned to look past the glamor of the "swordmaiden" type. The book's first chapter sees her, at fifteen, running off to join the army, and when the imperious matriarch of her family shows up at the camp to take her back home (because Tavis is more important as a pawn in marriage games than as a soldier fighting for Olondria), there follows a scene familiar from many stories of this type, in which Tavis's beloved book is burned, and she defiantly announces that she will never go home. And yet almost immediately, Samatar sweeps us forward in time, to Tavis's military service, in which she and her men commandeer the last supplies and livestock from starving villages on the northern border, and slaughter their own horses for food. It's a deliberate—and familiar—rebuke to the notion that there is something grand about women who defy social conventions, only to fall into them again by becoming instruments of war and imperialism. One that is repeated by Seren, whose tribe has lost most of its men in Dasya's rebellion, when she observes to Tavis that "Many women would like to do as you do. Some have begun, in the aftermath of war. They wear their hair loose. They would like to dress like men, to kill like men. To kill." I used to love it when Haidhas got slapped for answering in the che, so happy I wanted to hug myself. I was the good one, I never got slapped for talking. He was an outsider. The che inside me like a well of gold. And then I grew up and this gold was worth nothing, nothing. You can't use it anywhere. It's only for fighting with other women, or for crying. The songs that Seren sings are almost all songs about men, and almost all songs about sadness and loss, and throughout her portion of the narrative Seren wonders whether a different way is possible. Can she sing a woman's song? Can she sing a song about happiness, or are the domestic topics that lead to that happiness too trivial to support real art? And what does it mean that in order to expand her definition of art, Seren has to use the tools of her oppressors (the very word for laughter comes to her people from Olondrian)? Perhaps, as Seren says to Tavis, there is no way for them, as women, to participate in a system created by and for men: "She said that this war would not be mine, I would never triumph. She, who knew nothing of war, told me that I, a woman, would never be remembered, that any victory would be Dasya's and not mine." Somewhere between Tavis, whose life is defined by stories and narrative, and Seren, who distrusts narrative and all forms of literacy as a tool of her oppressor, is Tialon, who has been deprived of narrative but whose life is nevertheless ruled by writing. Unlike Tavis, whose chapters are full of action and event, Tialon’s life is defined by restriction and confinement. She has lived her entire life on the same island, within the same set of rooms, governed and controlled by her father’s whims and the rigid, joyless religion to which he has made her a handmaiden. In the present, Tialon’s father is dead, but she remains trapped by both the soldiers of Dasya's forces, and her own stunted emotional growth. To Tialon’s father, anyone who requires more than words from their gods is a child—he dismisses the cult of Avalei because "the image is vulgar, the gods have said; it coarsens the spirit and dulls the intellect. Who but an infant needs to receive the world through pictures?" At thirteen, he mocks Tialon for still reading a book of fairy tales, and the passages he translates off the Stone and promulgates as wisdom from the gods are prescriptive and chilly, focused on the life of the mind and disdainful of the corporeal and the mundane. That Tialon questions—in her own limited, powerless way—her father’s philosophy is directly linked to her gender. When her father’s star pupil Lunre introduces her to passages from the writings of the physician Ura, she finds herself drawn to them "because it was a philosophy of the body." Because as a woman the corporeal is ever-present with her in a way that her father, like so many men before him, is able to ignore in himself. "Her father would never make her feel that she was not worthy to study the words of the Nameless Gods, he would never suggest that she was too timebound to touch eternity, he would never even mention that she was a girl. Yet she felt it obscurely, always." As Tialon eventually reveals, that capacity to not see what doesn't suit his philosophical framework extends even to the holy relic itself, the Stone, which contains writing that her father chose to ignore or consider heretical, writing that encourages kindness and compassion, writing that talks about mundane issues of trade, the care of livestock, and relations between neighbors. The book is perfect. It is perfect because it admits of no contradictions. It is perfect because a great number of the words written on the Stone—more than half, in fact—are absent from its pages. Interspersed between the four heroines' narratives are chapters from a scholarly work (titled Our Common History , a title whose ominousness takes a while to register) describing the genesis of the Olondrian empire and the events leading up to the war. It’s in these chapters that we discover that the business of The Winged Histories is not simply with stories and narrative, but with language itself. The very justification for Olondria, we learn, is language.
. . . that the people of Hernas, who called themselves Lath (from the ancient lak-thet, "vine-grower"), sought forcibly to unite themselves with the Kestenyi and Nains, their neighbors to the east and northeast, who spoke languages related to their own; that their justification was their common ancestry. For a time we tried to worship Avalei, because it was law. I remember my mother speaking of her as the Rose, this we understood, we have always sung of roses in the highlands, where they bloom so briefly. But the rest—the pigs, the vultures, the grain—this confused us and left us numb. Where is our grain? Where do we bury seeds and revive them in the same place? As the quotes from Our Common History progress, their tone of detachment and scholarly objectivity fades. Suddenly we are privy to people’s thoughts and feelings, as well as their actions, until eventually the narrative is forced to concede that it is in fact a character in the story ("How do we know? Why, because we were at the window, peering through the slit between the shutters"), thus forcing us to ask who the "we" and "our" in the title are (a question that is never fully answered). By the time we reach the final chapter, Siski's story, the gap between personal narrative and scholarly work has been erased. Unlike the other chapters, which were told in their heroines' voices, Siski’s is told in a tight third person. This seems especially fitting since Siski is the only one of the four heroines who is not writing her story down. The only thing she writes is a letter to Dasya, but it is lost before anyone but us can read it. It occurs to me that perhaps we did not understand [the Stone]'s message, that this message may have been concealed in plain view. Why so many languages? Different tongues, different scripts, some of them dead. The hours we spent poring over dictionaries and grammars. We thought the message of the Stone, arriving in such a spectacular form, would unite us. But perhaps its true message was one of disintegration . . . Or perhaps it spoke a message of unity we could not understand, one that did not unfold in language as my father thought, but rather in the way the lines crossed over one another, cutting across each other, one word into the next. If the message is not in the words but in the cutting. How flint etches stone, how diamond enters. How flesh intersects with flesh. Newer languages digging themselves into old ones, accounts of vampires into the meditations of some nameless saint. How we are written into one another. How this is history. And indeed, both women’s response to the stories in which they’ve been immured is to stop talking. Tialon, when she’s brought before the new king, is expected to ask for the Stone, so that she can continue her father’s work. Instead, she asks for permission to leave the royal island, and disappears from the story. Siski, too, slowly drops out of life, disappearing from view of everyone who knows her until finally even the "we" who are writing this novel lose sight of her. And Tavis and Seren go into the mountains, taking up the nomadic life that, according to Tavis’s aristocratic friends, puts them outside the bounds of civilized life because "in order to have history, one requires a means of recording history." For all of the women in this novel, survival, and escape from the strictures of the stories that have bound them (and from the strictures of the genre of their story) comes by removing themselves from the narrative. It’s a less conciliatory ending than Samatar offered in A Stranger in Olondria, whose protagonist was able to find some middle ground with empire and its colonizing culture, to take what he needed and use it to enrich his own culture. Here, the master's tools can’t be used to dismantle his house, and the only option for women who want to tell their own story is to drop out of the story we’re reading. As Samatar says of it, The Winged Histories touches on "everything" that is strange or troubling in the epic fantasy genre, more than can be covered in a single review—I have, for example, said very little about the fraught relationship between the Kestenyi nobles and their people, about Tavis’s complex redefinition of her identity, in the face of almost everyone around her who insists that she is not Kestenyi at all; and there are, in addition, monsters at the end of this book that linger over the entire story like guns on the mantelpiece, but whose significance is, quite deliberately, hard to parse. As a result, The Winged Histories can come to seem, not baggy or shapeless—Samatar is far too skilled an author for that—but hard to grasp. There is too much here to sum up, and the book contains its own contradictions. Almost every statement that it makes—about fantasy, about gender, about identity, about language—is contradicted elsewhere. This is, perhaps, to be expected from a story about the insufficiency of stories, whose characters find their freedom by refusing to be characters anymore. So it’s perhaps inevitable that one would finish this novel feeling both thoroughly satisfied and eager for more, desperate to talk about it and convinced that it can’t be properly discussed. It is—and this, again, comes as no surprise—a major and important work of modern fantasy, and also a meditation on how fantasy is, perhaps, insufficient for all that we want to say.